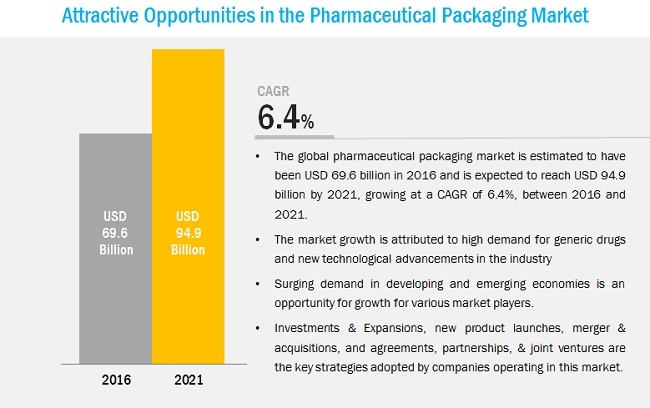 The pharmaceutical packaging market was valued at USD 65.55 billion in 2015 and is projected to reach USD 94.93 billion by 2021, at a CAGR of 6.4% from 2016 to 2021. In this study, 2015 has been considered as the base year, while the forecast period has been considered from 2016 to 2021. Advanced manufacturing processes, technological innovations, and increased integration of companies have resulted in rapid growth of the pharmaceutical industry. This, in turn, has fueled the demand for pharmaceutical packaging, globally. 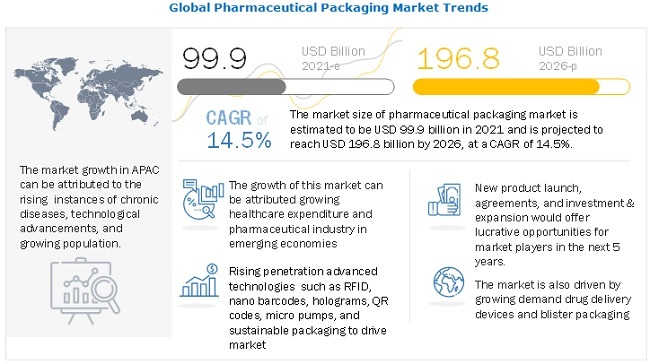 Growth of the pharmaceutical packaging market is expected to be the highest in emerging economies of Brazil, Russia, India, and China, supported by increase in income and growing awareness about the advantages of good healthcare systems and healthier lifestyles. Large population and favorable demographics such as growing young population and higher life expectancy of these countries are also the key drivers of this growth. With the growing economies of these countries, the need for pharmaceutical products & services is also growing, resulting in rapid growth of the pharmaceutical industry. The US IMS institute for Healthcare Informatics stated through a report in 2012 that these emerging economies will account for around 30% of the global expenditure on healthcare by 2021. For example, the healthcare expenditure by China was 5.5% of GDP in 2014. Similarly, Brazil and India allocated 8.3% and 4.7% respectively, in 2014. The main objective of the study is to define, describe, and forecast the pharmaceutical packaging market on the basis of type, drug delivery, veterinary vaccine, raw material, and region. The report includes detailed information about the major factors, such as drivers, restraints, opportunities, and industry specific challenges influencing the growth of the pharmaceutical packaging market. The report strategically analyzes market segments with respect to individual growth trends, growth prospects, and contribution to the total market. In the report, the pharmaceutical packaging market has been studied for five major regions, namely, North America, Europe, Asia-Pacific, South America, and the Middle East & Africa. In this report, market sizes have been derived through various research methodologies. In the secondary research process, different sources have been referred, to identify and collect information for this study on the pharmaceutical packaging market. These secondary sources include annual reports, press releases, and investor presentations of companies, white papers, certified publications, and articles from recognized authors. In the primary research process, sources from both, supply and demand sides have been interviewed to obtain qualitative and quantitative information for this report. The bottom-up approach has been used to estimate the market size, in terms of value. The top-down approach has been implemented to validate the market size, in terms of value. With the data triangulation procedure and validation of data through primaries, exact values of the sizes of the overall parent market and individual markets have been determined and confirmed in this study. The pharmaceutical packaging market includes raw material suppliers, different segments of the pharmaceutical industry, manufacturers of pharmaceutical packaging, and end users. Raw material suppliers include various mid-level companies as the raw materials involved in the production of different types of packaging are purchased in bulk. Amcor Ltd. (Australia), Schott AG (Germany), AptarGroup, Inc. (U.S.), Gerresheimer AG (Germany), Becton, Dickinson and Company (U.S.), and Capsugel Inc. (U.S.), among others are the leading players operating in the pharmaceutical packaging market.. In December 2016, Aptar Group expanded the production in its manufacturing site in New York. This has helped the company in providing better packaging service to the North American customers. In December 2016, Becton, Dickinson and Company (U.S.) launched BD Neopak 2.25 ml prefillable glass syringe. This advanced prefillable syringe for higher volume injection of biologics has helped the company in expanding its pre-filled syringe product segment. In August 2016, Berry Plastics Group, Inc. acquired AEP Industries Inc. (U.S.). This acquisition has added both new products and new customers to the company’s existing database, especially in North America. Each region is further segmented into the key countries in the respective regions. What are the upcoming technologies in pharmaceutical packaging? The pharmaceutical packaging market is projected to grow from USD 65.55 billion in 2016 to USD 94.93 billion by 2021, at a CAGR of 6.4% from 2016 to 2021. The growth of the pharmaceutical packaging market is driven by increasing demand for drug delivery devices and blister packaging, rising demand for improved healthcare services due to growing urbanization in emerging economies, and technological advancements taking place in the field of pharmaceutical packaging. The plastic bottles type segment accounted for the largest share of the pharmaceutical packaging market in 2015. The growth of this segment can be attributed to ease of production of plastic bottles, wide acceptance of plastic bottles in the pharmaceutical industry, and protection provided by them to medicines from harsh environments, such as snow and moisture, among others. The pre-fillable syringes segment of the pharmaceutical packaging market is projected to grow at the highest CAGR during the forecast period, 2016 to 2021. Pre-fillable syringes are most widely used as they offer efficient and effective delivery of drugs. Moreover, increase in the number of people suffering from diseases such as diabetes is also a major driving factor for the growth of the pharmaceutical packaging market. Based on drug delivery, the oral segment is projected to lead the pharmaceutical packaging market during the forecast period. Oral drug delivery mode is widely used to administer drugs through mouth, which proves to be an easy and efficient method of drug administration. The injectables segment of the pharmaceutical packaging market is projected to grow at the highest CAGR during the forecast period. Growing demand for pharmaceutical packaging from emerging economies, innovations in the field of pharmaceutical packaging such as development of nanotechnology, child resistant packaging, radio frequency identification, and others, and increasing use of plastic bottles and blister packaging for pharmaceuticals, owing to their ease of use are the major drivers for the growth of the pharmaceutical packaging market, globally. The North American region accounted for the largest share of the pharmaceutical packaging market in 2015 and is expected to continue leading the pharmaceutical packaging market during the forecast period as well. The Asia-Pacific pharmaceutical packaging market is projected to grow at the highest CAGR during the forecast period, owing to increasing demand for improved healthcare services in the Asia-Pacific region. Development of new ways to prevent counterfeits of original drugs and financial constraints in underdeveloped regions are posing a challenge for the growth of the pharmaceutical packaging market. Plastic bottles segment is composed of rigid plastic and are preferred because of their lightweight and shatter-resistant quality. Plastic glass and child-proof and tamper evident caps are the major trends driving the plastic bottles market in pharmaceutical packaging. These bottles will remain the most widely used pharmaceutical packaging for oral drugs and prescription dose distributed in bulk to retail and mail order pharmacies. Blister packaging plays an important role, especially, for oral and solid dosage forms. Blister packages are made from thermoforming polymers and cold-form aluminum-based packs. Increased unit dosage packaging usage, individual protection of each dose, excellent barrier characteristics, design flexibility to meet regulatory compliance, fair amount of child resistance, and senior citizen-friendliness are the key influencers for their growing use worldwide. Blister packs also provide efficient and safe drug delivery for oral solids. Labels list ingredients and warnings against misuse and provide enough space for authenticity confirmation and branding. Labels are helpful in logistics management and handling of products these days. Leading pharmaceutical companies are using labeling extensively to carry information about the product to meet the packaging regulatory compliances and fight counterfeiting. These aspects are the key drivers for the pharmaceutical packaging suppliers in the industry. To meet the FDA requirements and current Good Manufacturing Practices (GMP), it is essential that pharmaceutical labeling is accurate. Caps & closures feature child resistant and tamper evident packaging. These were developed to reduce the risk of children ingesting medications, which would prove to be harmful to them. It is mandatory under various regulations for prescription drugs, OTC medications, pesticides, and household chemicals to focus on child-resistant closures. Tamper evident packaging helps in identifying whether a particular package has been breached or not for prevention of malicious tampering. Increasing overall packaging costs, owing to dynamic regulatory measures, and stringent regulations set by various governing bodies on the manufacturing of counterfeit medicines are the major restraints for the growth of the pharmaceutical packaging market. In addition, there is further need for innovations in the pharmaceutical packaging to offer improved services to customers across the globe. Continuous portfolio optimization is important to stay competitive in the pharmaceutical packaging market. As such, market players operating in this market are collaborating with each other to develop new and innovative products, technologies, and manufacturing processes. These collaborations are expected to reduce competition in the pharmaceutical packaging market during the forecast period. The key players, such as Amcor Ltd. (Australia), Schott AG (Germany), AptarGroup, Inc. (U.S.), Gerresheimer AG (Germany), Becton, Dickinson and Company (U.S.), and Capsugel Inc. (U.S.) operating in the pharmaceutical packaging market have adopted both, organic as well as inorganic growth strategies between 2012 and 2016 to strengthen their position in the market. 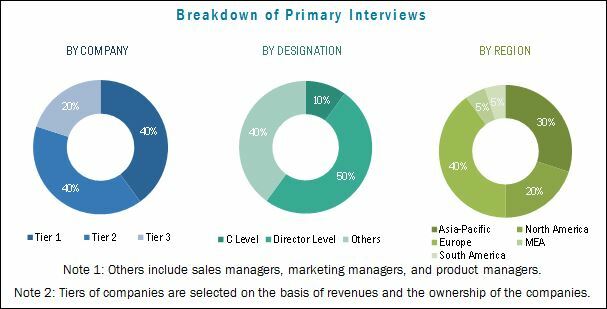 New product launches, investments, and expansions have been the major organic growth strategies adopted by the market players to enhance their regional presence and meet the growing demand for pharmaceutical packaging in the emerging economies. 13.8 West Pharmaceutical Services, Inc.
13.9 Berry Plastics Group, Inc.